Mt. 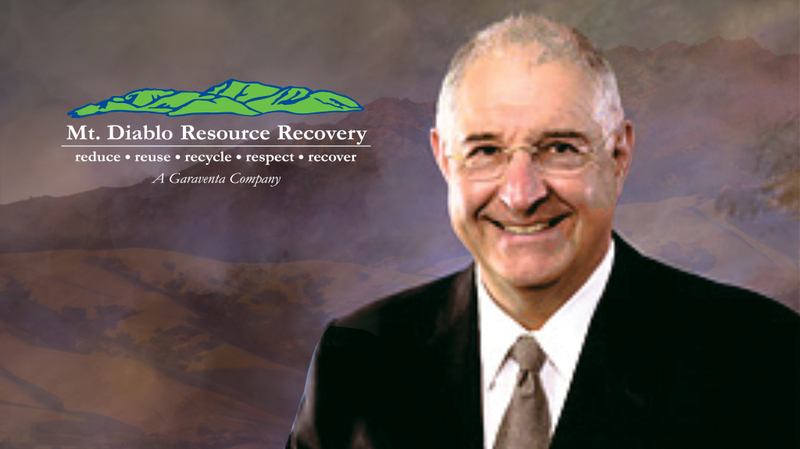 Diablo Resource Recovery, a Garaventa Company, has served the residents of Contra Costa for over 75 years. We are a family-owned company with deep ties and an unyielding commitment to the quality of life in the communities we serve. This has driven us to work hard, work smart, and strive for excellence in the way we collect and process local recycling and waste materials to maximize our contribution to our local health, safety and environment. Accordingly, recycling has always been a critical part of our business. We are by far Contra Costa’s largest recycling processing operation. Our company does not own a landfill. So, it’s in our DNA to see that the maximum amount of material that comes through our operation is recycled. That’s why Resource Recovery is in our name and disposal is not. So even in the face of complex recycling mandates from the state and federal governments, we have always stepped up to the plate and gotten the work done. Because it’s what we do. As of January 2018, a monumental policy shift by the government of China has upended the global recycling market and is confronting companies and communities like ours. For years, the vast majority of processed recycling material from the US (California especially) was purchased by China. But this abrupt change, known as “National Sword,” has resulted in China massively decreasing the volume of recycled material it is willing to accept. In short, this has had a catastrophic effect on the traditional economics of recycling. It’s a profound change to the entire world of recycling and we must all now change with it. Communities across the country are reacting to this crisis in different ways. Some believe this is the “new normal” and have simply stopped accepting many items to be recycled. These items include forms of paper, cardboard, plastic and glass. In some communities, they are items are no longer accepted in the recycling cart but are destined for the landfill. This is not the case in our community. But we need your help. For us, such changes would cut against our local culture and commitment to resource recovery and environmental best practices. So rather than just give in to these global forces, we believe it’s time to come together and do all we can locally to Save Recycling. Everyone needs to join together – our company, our customers, all levels of government leaders working together to solve this problem. Reduce – Recent changes to the global recycling markets have made it difficult, if not impossible, to recycle certain types of paper like magazines, junk mail and newspaper ad inserts. Please try to Reduce your consumption of those materials. Clean your recycling. The cleaner your jars, containers and other items the more they can be recycled. Know what’s recyclable and what isn’t. The cleaner the overall recycling stream, the more that can be recycled. Spread the word. We are continually developing resources and tools to help all our customers spread the word across our community. Over our 75 years, we have overcome countless challenges by standing upon our values and by relying upon our strong local partnerships. Together, WE can overcome this challenge too.